Here comes the beautiful Sailing 810 Drip Tip made of advanced thermochromic epoxy resin material which will change color in different temperature. Just get it as a spare part. Here comes the high quality Sailing Color Changing Epoxy Resin 810 Drip Tip. 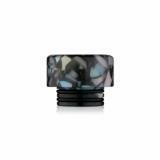 The Sailing 810 drip tip is designed for most mainstream atomizers of 810 drip tips especially for TFV8/TFV12 tank! Made of advanced Epoxy Resin with thermochromic material, the SL208 810 Drip Tip will change color in different temperature. 1pc each pack. Just get it as a spare part. The color is random. • Please note that the color is random. 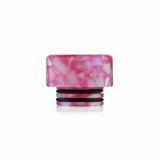 • It's for most 810 drip tip atomizers. Sailing Color Changing Epoxy Resin 810 Drip Tip for TFV8/TFV12 SL208 is designed for most mainstream atomizers of 810 drip tips especially for TFV8/TFV12 tank! Made of advanced Epoxy Resin with thermochromic material, the SL208 810 Drip Tip will change color.